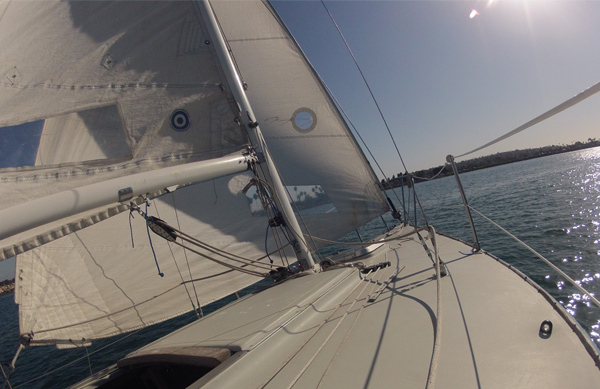 Have you ever had the idea of owning or chartering your own sailboat and being able to sail all over the globe? Now we can help you attain that dream for an unimaginable price. The Mission Bay Aquatic Center is excited to now offer an unbelievable package for students looking to earn both the US Sailing Basic Keelboat and Basic Cruising Certifications for $999 or $799 for current SDSU or UCSD students. Upon completing these certifications, you will have in your hands what most facilities consider to be licenses to sail an auxiliary powered sailboat, during daylight hours, within sight of land in moderate wind and sea conditions. The Basic Keelboat and Basic Cruising Certification Package includes the Basic Keelboat Series (Levels 1, 2, and 3), the US SAILING Basic Keelboat Certification, the Basic Cruising course, and the US SAILING Basic Cruising Certification. It also includes a year membership to US SAILING, written exams at the end of each course, an official US SAILING log book, and the Basic Keel and Basic Cruising text books. Purchasing the package will save you up to $213.00, a 20% savings! US SAILING is the national governing body of the sport of sailing and here at the MBAC we are proud to offer the first two levels in US SAILING’s Keelboat Certification series. If you are new to sailing, or new to keelboats, these courses will teach you the fundamentals of learning to sail a 24 foot keelboat and the basics of cruising in a small keelboat. The certifications that you can earn at the end of each class are a great way for you to take what you have learned with you, and verify your skills through US SAILING. You will be able to use these certifications as a path toward chartering a sailboat in an exotic location. This package is an opportunity unlike any other allowing you to get the most out of our classes at an affordable, unbeatable price. Let us help you obtain these sailing certifications and your lifelong dream of being able to sail anywhere in the world! For a description of practical skills that you will learn in each class, as well as a schedule of upcoming courses, please visit http://www.mbaquaticcenter.com/sailing.htm#BASIC_KEELBOAT_SAILING_LEVEL_1.